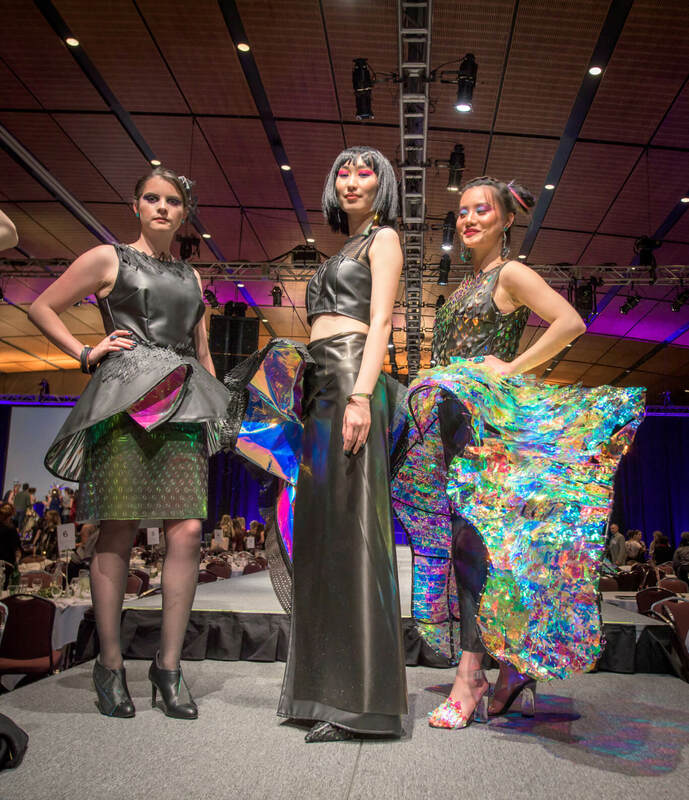 This fall the annual IIDA NE Fashion Show fired up the local design community at the Boston Convention Center. This year, our team produced a stunning, beautifully crafted, ready-to-wear fashion collection for the runway. We aimed to show off our fabrication and tailoring skills and demonstrate an attention to detail that is the hallmark of haute couture. 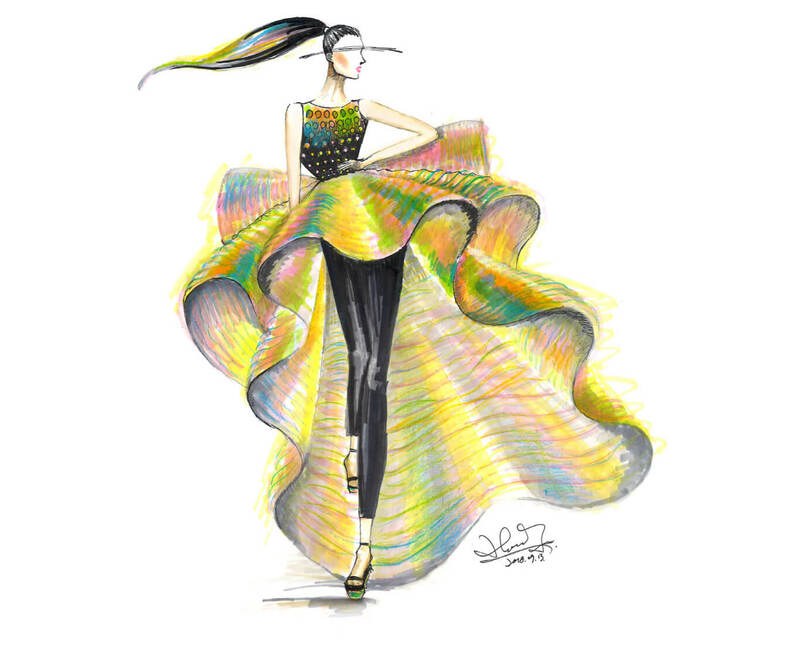 As the city lights twinkled outside, a ballroom filled with 1,500 spectators while the models walked the runway wearing incredible fashion pieces crafted from interior design materials. 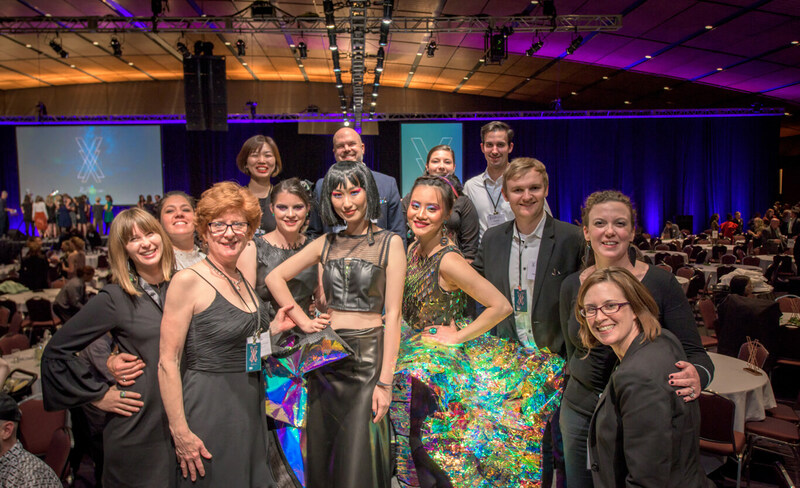 Each year IIDA New England puts forth a theme for the fashions how and the team this year was “Reflection.” Our entry, “Trichroic Mien” (which can be translated as emotional expression in three colors) explored how fashion reflects our emotions and personality. 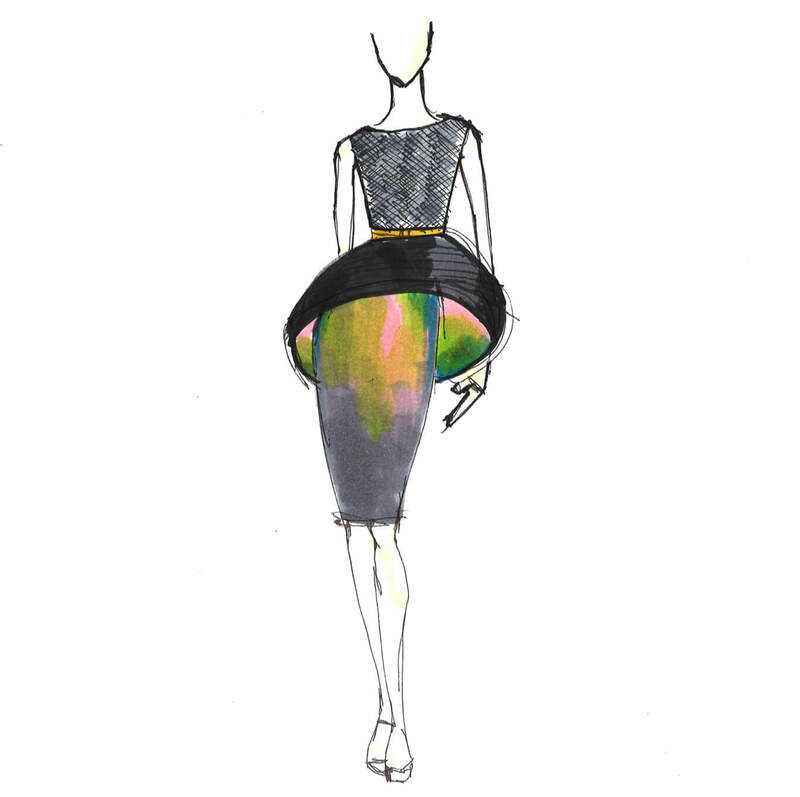 The little black dress, a fashion staple, was deconstructed and reimagined using color in different ways to represent hidden, controlled and wild emotional expression. Polarized, rainbow-hued dichroic film, typically an interlayer in laminated glass is featured throughout the pieces. Our Hidden look was defined by minimal color exposure; it is a subdued and layered piece. The base skirt utilized a semi-transparent PVB film interlayer to add depth and subtlety to the laser-cut material and film underneath. Expertly folded silver wallcovering peeked out from beneath the top skirt of black shading substrate to reflect the color below it. Our Controlled look had selective color exposure on the vertical ribbon, and selective skin exposure for a daring look. The long sleek skirt is crafted from PVB film and wallcovering, and the bold ribbon is finished with laser-cut black shading substrate. An asymmetrical earring finishes the piece. Our Wild look was an unbridled explosion of color, representing unrestrained emotional exuberance. 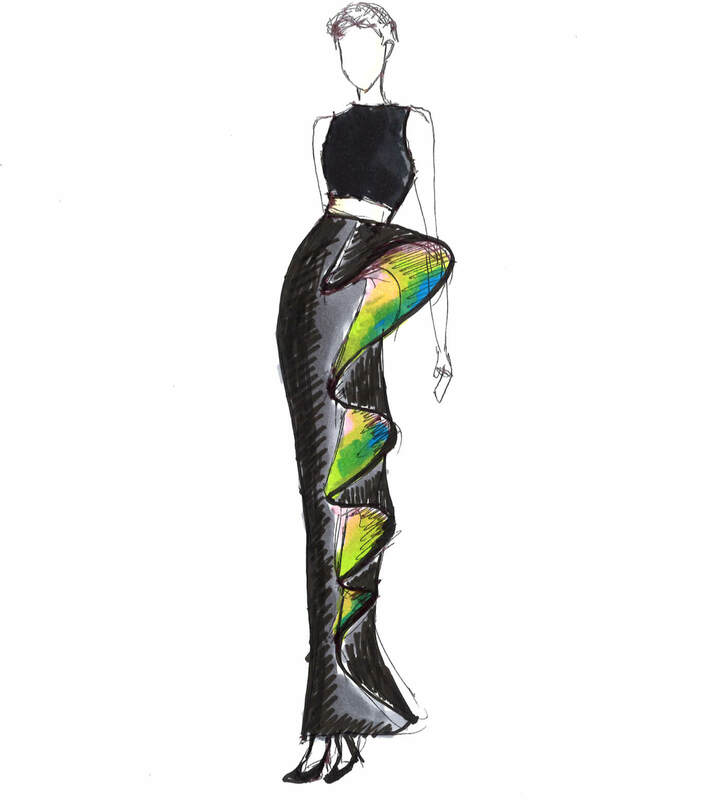 The look is dominated by the phenomenally crafted rainbow skirt. 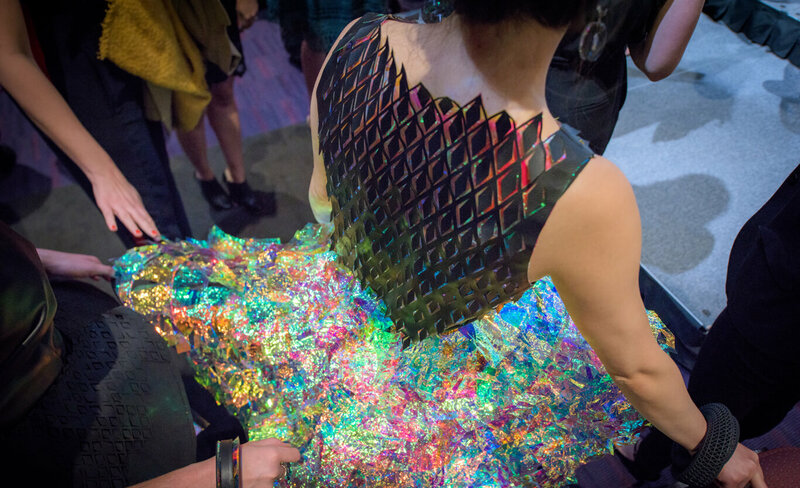 This skirt was designed in a modeling program, divided into panels, then fabricated from wire dichroic film. It took 150 assembly hours, 500ft of 14 gauge insulated copper wire, 2,000 laser-cut dichroic film modules and 8,000 dots of super glue to bring together this magnificent piece. The bodices for all three pieces were expertly tailored from a buttery faux leather, typically used in upholstery. The Hidden bodice featured a sweet and subtle laser-cut collar, the Controlled bodice was a daring bustier layered over a mesh window drapery cropped top and the Wild bodice had a fabulously intricate laser-cut pattern underlaid with the dichroic film. From head to toe our fashion collection included details from our in-house fabrication. Custom shoes for each model were created featuring hand sewn uppers and 3D-Printed heels. Epoxy resin jewels were cast utilizing shredded dichroic film for sparkling jewelry. Bracelets were 3D printed for each model to complement their individual aesthetic. All of the pieces were fitted and sewn (and resewn!) until our models dazzled. To top it off, the models’ walk was accompanied by a beautiful cover of “True Colors” that featured a custom guitar solo. 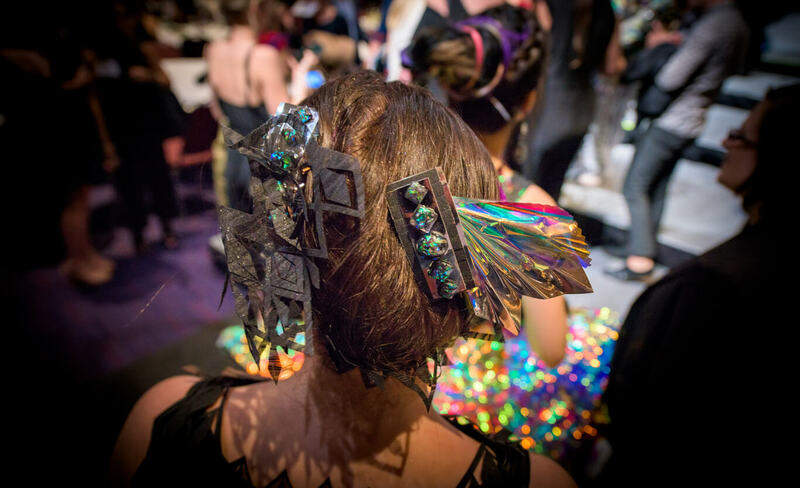 The annual IIDA NE Fashion Show is an incredible event that highlights creativity and teamwork. 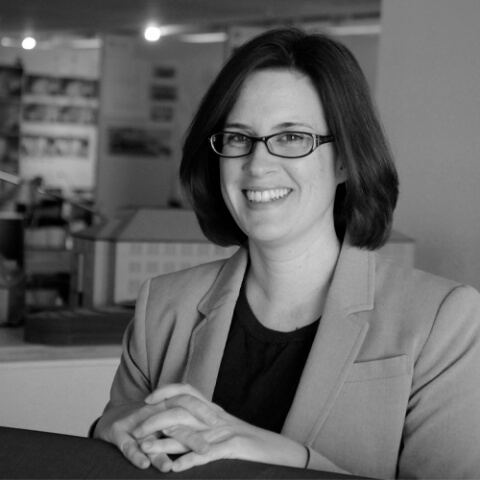 To add icing to the cake, the proceeds benefit YouthBuild Boston, a fantastic local organization that provides design education programs for teens in underserved communities.